I am really pleased with the topic of the latest Scientist in the Field book. This book will immediately circulate with the upper elementary students and teachers in my library. Two classrooms at my school recently adopted sea turtles, and students had the opportunity to Skype with the sea turtle facility in Georgia where their turtles live. 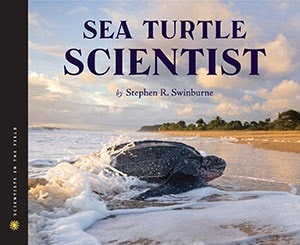 Stephen R. Swinburne takes readers to the beaches of St. Kitts to meet biologist Dr. Kimberly Stewart in Sea Turtle Scientist. Stewart works with the Wider Caribbean Sea Turtle Conservation Network (WIDECAST) to study, track, and conserve leatherback sea turtles. The book is well-organized and provides readers with information about the adaptations and survival techniques of leatherback turtles. Readers will be amazed at the journey a hatchling undergoes after hatching from an egg buried two feet under the sand. The hatchling must make it out of the sand to the open ocean without being eaten by a predator or scorched by the sun. Children interested in science will gain an understanding of Stewart's job. Part of her work is at the beach tracking leatherbacks, observing hatchlings and evaluating the habitat. Another aspect of what Stewart does is education. She works with WIDECAST to provide programs for school-age students as well as educating the community about the importance of sea turtles to the ecosystem. Readers will be enamored with Theophilus Taylor, a former sea turtle fisherman who now helps Stewart study sea turtles and educate children about the importance of conservation. Swinburne also traces the history of leatherback turtles from an abundant population to the source of meals for explorers and islanders. WIDECAST is currently working on a project to provide alternative jobs to turtle fisherman like Taylor so they may maintain their income without harming the leatherback population. The book does an excellent job of showing readers how important it is to save the sea turtle. Sea turtles eat jellyfish, which keeps the jellyfish population under control. If sea turtles die out, then the jellyfish population will explode. Jellyfish eat fish larvae and plankton, so having a huge jellyfish population would be devastating to fish. Middle grade readers will enjoy seeing children help out in the conservation effort in Chapter 7: It Takes a Community to Save a Sea Turtle. There is even a page listing the items scientists bring to a turtle-watch including a handheld GPS to mark down the latitude and longitude, flipper tags and laundry bags to relocate eggs. Back matter is rich and includes a glossary, ways to help a sea turtle, information on adopting a sea turtle, lists of web sites & books, and an index. Dr. Stewart's work saving leatherbacks is an inspiring story that should be shared with middle grade and young adult readers. Visit the author's web site to read the first chapter of the book, access a classroom discussion guide and learn more about saving sea turtles. View the Sea Turtle Scientist book trailer.